Abbington of Powell Assisted Living has been proudly serving the Powell, Dublin and surrounding communities since 2002. This single-story community consists of 48 residential units situated on scenic wooded grounds. Abbington of Powell boasts abundant common area amenities, beautiful interior courtyards as well as walking paths. 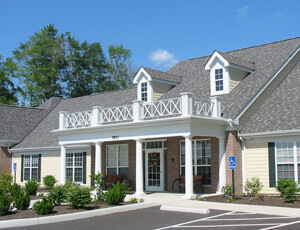 You will experience and appreciate the comfortable, family atmosphere unlike any other assisted living community. We invite you to contact us or call Katie Lehman, Executive Director, at (614) 789-9868 ext. 201 (or option 3) for a personal tour at your convenience. Abbington’s Powell Assisted Living is located in the Powell/Wedgewood area, northwest of Columbus, on the corner of Sawmill Road and Bradford Court, approximately 1 mile south of Powell Road and just east of Sawmill Parkway. The surrounding neighborhood primarily consists of single family homes with numerous dining, shopping and recreational establishments nearby. At Abbington of Powell, we value the independence of our residents. No one wants to feel like a burden to their family. It adds stress for everyone. At our assisted living communities, the residents don’t depend on their children for everything. Instead of worrying about eating habits, medication, and housekeeping, visits can be relaxing, happy. When residents have their family visit we want everyone to be stress free. That’s what assisted living is all about. Now life can be enjoyed. While residents don’t have to depend on their families, they’re not alone. Our trained staff are available 24 hours a day. Residents can get help with any daily activity. The caring staff members are always there to make life easier. Abbington really feels like home. Fellow residents become friendly neighbors. Cozy fireplaces and parlors enhance your experience. Your private room has enough space for personal touches. It’s not a hotel or a hospital. The room becomes your own. Pictures and decorations are encouraged. It’s not just a place to live, it’s home. Everything was ready, clean and the entire staff was ready and responsive to meet our needs during move in. The activities director did an outstanding job to help Pam assimilate to her new surroundings. I must say that when I first met with Jennifer (Executive Director) regarding the possibility of locating my dad at Abbington, I felt like she was presenting me with a 'home that could meet his needs'. I felt no pressure to make a decision or that she was simply running a business to meet her financial budget needs or to 'fill the house'. She presented herself as confident and with a real love for her job and knowledge of how to run it to make it 'home'. I've been so blessed to have my mom at Abbington. Tammie is an exceptional woman that works during the day at Abbington, and I've known her from day one. She has always enjoyed helping my mom through the years and it has always been great to see her! Brittany is a great joy to everyone. She is always upbeat, and smiling all the time. I believe she can walk into a room and her joyful personality alone could help change a bad day for the folks there. I always tell my wife that if she ever feels the need to have a place take care of me once I get too old and need assisted living, she better be sending me to Abbington! 🙂 !